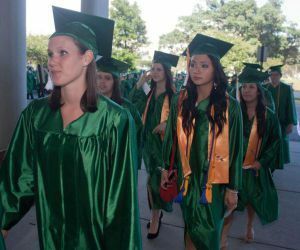 More than 900 students will surpass a life milestone in the coming weeks as Pensacola State College prepares for spring commencement, Collegiate High and Adult Education graduations and nurses pinning ceremonies. Sen. Doug Broxson will be the keynote speaker for Pensacola State’s graduation set for 3 p.m. Sunday, May 7, at the Pensacola Bay Center. More than 800 students are slated to receive associate and bachelor degrees along with certificates during the commencement exercises. A Republican member of the Florida Senate, Broxson represents District 1 which includes Escambia and Santa Rosa counties, and a part of Okaloosa County. He previously served in the Florida House of Representatives, representing northern Okaloosa County and Santa Rosa County from 2010-16. A Pensacola native, he attended Pensacola Junior College before transferring to Evangel University where he earned a bachelor’s degree in 1971. Collegiate High School and Adult Education joint graduation will be held at 6 p.m. Thursday, May 4, in the Lou Ross Center on the Pensacola campus. Kaitlin Santiago, a Pensacola State student and the Florida College System Student Government Association president, will address the 75 Collegiate High and 13 Adult Education Program graduates. Santiago, who will earn her associate degree in international business this spring, also served as a spring semester intern for the Florida House Internship Program. During her freshman year, she was Pensacola State’s SGA president and has served as an intern for Pensacola Mayor Ashton Hayward. The 2013 Milton High graduate plans to transfer to a university this fall and eventually attend law school. Cynde Gamache will speak during the ADN and BSN nurse pinning ceremonies set for 3 p.m. Thursday, May 4, in the Lou Ross Center. Thirty-three graduates will received associate degree pins, while 11 bachelor’s degree graduates will be pinned. Gamache is the system vice president of patient care services and chief nursing officer at Baptist Health Care. She has worked in the health care industry as a registered nurse for more than three decades. Gamache earned her bachelor’s degree in nursing from the University of Connecticut, a master’s degree in organizational administration from MidAmerica Nazarene University and her doctoral degree in business administration from Northcentral University. She also holds the Nurse Executive, Board Certified credential from the American Nurses Credentialing Center. To participate in commencement ceremonies, graduates must be attired in full academic regalia. Caps and gowns are now available in all campus bookstores. Graduates who need special sizing should place an order at a bookstore. During the ceremony, tassels also should be worn on the right side until the graduate receives their degree, diploma or certificate – then it is moved to the left. Graduates are urged to dress professionally. Women should wear business attire and men should wear a dress shirt and tie with long trousers. Flip-flops or beach sandals should not be worn.